Delk stands outside the auditorium at Marietta Middle School. The campus is the former site of Marietta High School, which Delk helped integrate in 1964. MARIETTA — They don’t have the name recognition of Rosa Parks or Jackie Robinson, but there is a class of heroes spread out across the nation, each of whom made a decision to accept the scrutiny of being the first black student at a previously all-white school. For Marietta High School, that’s Daphne Delk, who integrated MHS in 1964 after spending her freshman year at the black-only Lemon Street High. Delk was born in Marietta in 1949 to a father who worked in a steel mill and drove a taxi and a mother who worked as a maid. At the time, Delk said, that was about as high up the economic ladder as African-Americans could hope for, but she said her parents always encouraged her and her siblings — she had four brothers and a sister — to aim for a better life. Delk said at that time, it was acceptable for black children and white children to play together when they were very young, but once they got a little older, “They cut it off,” she said, making a chopping motion with her hand. Delk said she had what she considered a normal childhood, never really thinking about the disparities between black and white children because she rarely interacted with white people. She said she had a number of role models in the black community, including servicemen, teachers, nurses and Dr. Wilburn Weddington, the first African-American physician to belong to the Cobb County Medical Society. She said a special mentor was a cousin, Chester Jackson, who, despite having a limited education, came back from World War I and became a successful homebuilder. During her first year at Lemon Street High, Delk started questioning whether she was actually getting the right education. It was the 1960s, and some of her schoolbooks had been printed in the 1930s. Delk talked about transferring schools with a friend, Treville Grady, and credited Treville’s mother, Katherine Grady, with helping them through the application process, during which they had to submit an essay and receive a physical examination. Delk’s parents were not sure at first whether it was a good idea for her to go to Marietta High, worrying about bullying and racist attacks, but Delk said she convinced her father by showing him her obsolete textbooks. Both young women were admitted and began the 1964-65 school year at Marietta High. Grady dropped out after she became pregnant. The first year was the hardest for Delk, as the city’s underbelly made itself known. To top it off, some of her classmates were unhappy to share a school with her as well. Delk had only kind words about her Marietta High School teachers, who she said supported her and treated her fairly. The school guidance counselor checked up with her regularly to make sure she was OK. Academics were a challenge that first year. Delk also had nothing but praise for the teachers at Lemon Street, saying they were dedicated to teaching and did the best they could with their limited resources, but a second-rate education left her behind her new classmates. Delk said she turned to some of the smartest students from Lemon Street to help her get caught up academically, and by her second year, her hard work started to pay off. The fact that six more black students transferred in that year made things easier, and Delk said the white students also learned to accept she was there to stay. Eventually, the other students would not get up and leave as soon as she sat down at the lunch table. Eventually, the students at the lunch table became study partners and even friends. “When they realized I wasn’t trying to fit into their world, that I was just trying to do me, then it became easier for them to accept me, and that’s what they did,” she said. 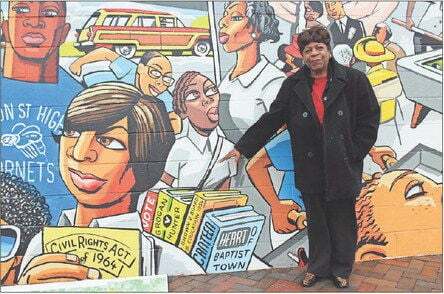 Jeanie Carter of Marietta began teaching at the segregated Lemon Street Elementary in 1957 at age 23. In those days, Carter said once black students graduated from Lemon Street Elementary, they headed across the street to the segregated Lemon Street High, the only black high school in the county. Carter transferred to Hickory Hills Elementary as its first black teacher in 1967. 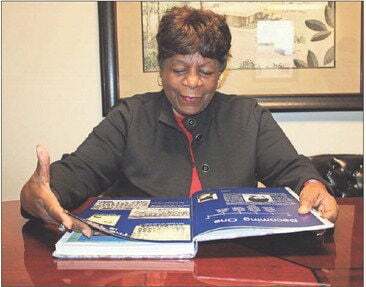 She retired from Marietta Middle School in 1991 and went on to serve 16 years on the Marietta Board of Education, the first black woman elected to public office in Marietta. Carter remembers when Delk transferred to Marietta High. “Well, it took a lot of bravery all right, and I felt that she was the type that could stand it,” Carter said Thursday. Carter laughed as she recalled the dated textbooks the black schools had to work with at the Lemon Street schools. While they were both the first African- Americans to integrate a school, Carter believes Delk likely had a more challenging time being a student than she did as a teacher. “Probably Daphne did, honey, because I was more mature to know what to expect and how to handle it, you know. So I think as an adult I could ignore a whole lot of stuff. She handled it pretty well, though. She was a very conservative, business-type person. Not a whole lot of playing around and stuff. She was serious about what she was doing … a very good role model,” Carter said. By the time she graduated, Delk was still dedicated to her studies, but she had also gained a reputation as a jokester and was so popular she was named “Girl of the Year” her senior year. She said she had a lot of supporters in the black community, friends and neighbors who rooted for her and offered her help. But some were not happy with her for leaving Lemon Street. She said they believed the school was good enough, and that by leaving for the white kids’ school, she’d be encouraging more students to do the same, which is exactly what happened. “Pretty soon, the school went down in number because people were populating themselves at different schools around the area, not necessarily Marietta, but other white schools in their area so they could get a better education, and eventually, Lemon Street closed, to the disdain of some,” she said. Delk said she does not regret her decision and is proud to have been Marietta High School’s first African-American student. Like any high school grad, Delk said she was sad to leave her friends behind, but excited to start her new life as an adult. She went to Fisk University in Nashville for two years, then transferred to Atlanta’s Spelman College. Delk was in school during the height of the civil rights movement and attended meetings with groups like the Southern Christian Leadership Coalition, but said she was not able to get very involved because she was working to put herself through college. After graduating, Delk’s first job was as a laboratory assistant in a genetics lab studying sources of carbon. She said that work is the basis of today’s attempts to grow meat in laboratories. After that, she became a medical technologist for what is now Quest Diagnostics. She worked as a technologist for over 20 years before moving into sales with the same company and working another ten. Looking back, Delk said she doubts she could have found the same level of success if not for the knowledge she picked up at Marietta High. But she also said she owes a great deal to the family, friends and role models who helped her get past the challenges and keep her focus on her future.